"Well i would first like to congratulate the organizers, I think its a very original event. Last year I had the pleasure of playing in the museum and they have taken the concept further and combined it with great the chess legend, Alekhine." "And doing this with the two cities where he had a connection, I think will do honor to his memory." 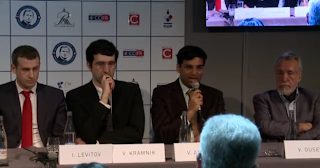 "I have had the chance to play in Paris before, but for me it will be the first time in St Petersburg and all in all I believe that this connection that they are making between art and chess; the artistic side and lets say the sporting side of chess is really wonderful and we are here to pay homage to a great champion." "I would say that most people would agree that Alekhine is in their list of favorite world champions. Some may start with Capablanca, some may start with Alekhine, but Alekhine will atleast be 2nd or 3rd. His games were really spectacular. " "And I hope we will get chance to produce something that he might enjoy!"